Academics from Bangor University have recently returned from an expedition to the Himalayas as part of a research project to investigate altitude related illness. Researchers Dr Samuel Oliver and Dr Jamie Macdonald, PhD student Gabriella Rossetti and undergraduate Sport Science student James Pollard - all from Bangor University’s School of Sport, Health and Exercise Sciences - were part of the 55-strong team comprising of medical doctors, scientists and mountain rescuers, who took part in the five-week expedition. Organised by Medical Expeditions (MEDEX), the expedition followed a trekking route to the 8000 m mountain Manaslu, reaching base camp at 5000 m where the team set up solar laboratories to conduct their research. The extreme winter weather made the conditions challenging at times, but the team were able to complete medical research with the aim of enhancing the health and performance of people who go into high altitude environments. 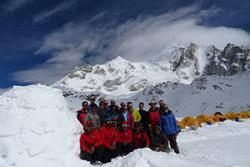 The expedition group at base camp. Physiology Lecturer Dr Samuel Oliver, who is part of the Extremes Research Group within the School of Sport, Health and Exercise Sciences, commented: “The reason we took part in this expedition was to complete research that will allow us to educate mountaineers, trekkers and their doctors about the nature and avoidance of altitude related illness. The Bangor University research team’s work now continues back in the School of Sport, Health and Exercise Sciences, where students will be helping with the work of collating and analysing the data collected over the coming weeks. They hope to disseminate and publish their research findings in due course, with the aim of also making the information available to trekkers and climbers. With Nepal still reeling from the massive earthquake on April 25, which killed more than 8,000 people, any plans to carry out future research there are currently on hold. The Bangor University research team were shocked and saddened at the scale of the human tragedy and devastation caused by the 7.8-magnitude earthquake, which one of the group – 21-year old undergraduate student James Pollard – witnessed at first-hand (see below). However, all the research team members are certain that they will return at some point, and contribute to the re-building of the country via the mountaineering and trekking activities which are a major source of income for Nepal. 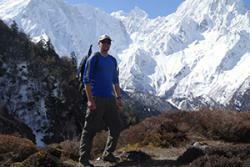 “We’d definitely want to go back to the Himalayas in future to actively support the rebuilding of Nepal. Tourism is the country’s main source of income so to be able to go back there to complete research in future is not only important to us, but also essential for Nepal and its people,” said Dr Jamie Macdonald. James Pollard, 21, from Oxford, who was still in Nepal when the 7.8-magnitude earthquake struck on April 25. The second year BSc Sport Science student has always been interested in altitude research, and was involved in the pre-expedition baseline testing in the Sport Science laboratories at Bangor University. His role during the expedition itself was helping out with the research and making sure that everything was set up properly at base camp. However, his time on the Himalayan expedition was overshadowed by the experience of being caught up in Nepal’s worst-ever earthquake, and witnessing just some of the devastation it caused. James and others from the expedition were in a hotel in Kathmandu, preparing to go to the airport for their flight home, when the earthquake struck. “The earthquake hit at 11.56am which was about three hours before I was supposed to get my plane,” said James. “Everyone was stunned for a couple of seconds then the hotel manager just shouted ‘earthquake’ and everyone instinctively ran out to the street, to get out of the building in case it came down. “It was pretty scary, you’re never prepared for anything like that, - you could hardly walk let alone run out of the building, the ground was shaking for a good 45 seconds. It was quite terrifying - everyone was screaming and you could hear walls coming crashing down. With all flights cancelled, James and his companions spent another night in the hotel before being moved by Embassy staff to a Gurkha camp to wait for flights out of the country. It was there that James first saw on-line news coverage, and became aware of extent and scale of the devastation caused by the earthquake. He described himself as deeply sorry for the people of Nepal and what they’ve gone through, and are still going through, in the aftermath of the earthquake. However James – like the other Bangor University research team members – is determined to go back there one day. “The effects of the earthquake have been truly awful and caused such devastation. However, it’s obvious that Nepal will still need people to go there as the country pretty much survives on tourism. Going back there will be a way of helping the country to rebuild after the earthquake.